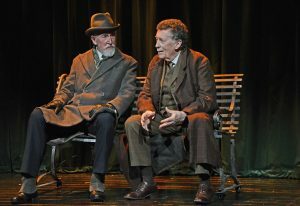 Robert Powell in Sherlock Holmes: The Final Curtain. Images Nobby Clark. There comes a time in everyone’s life when retirement is the only option. No matter how much you like working, or, indeed the work enjoys having your input, age, decrepitude of the mind and body, force their hand. 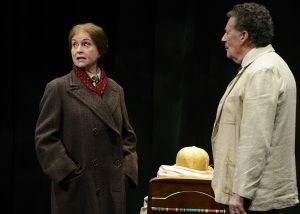 Age, and the symptoms of ageing, are a major theme in Sherlock Holmes: The Final Curtain, a Theatre Royal Bath production now touring the UK and this week playing at the Rose Theatre, Kingston. If the thinly plotted drama, starring accomplished actors Robert Powell and Liza Goddard, had been written by the great Conan Doyle we would probably have deduced that it had been in the twilight of his writing career. But this new play comes from Simon Reade who has his own distinguished career to back his credentials. It’s a perfectly reasonable effort, but nothing as developed, sophisticated or devious as the original author’s work. There are plot holes you could drive a bus through plus a wholly unconvincing denouement and story twist. And, above all, a lost opportunity to fully explore how a very big fish in a 19th century pond is struggling to survive as an overlooked, and forgotten minnow, in the rapidly changing, revolutionary, times of the early 20th century. Final Curtain isn’t awful. There’s enough to keep your interest. But fans of the genre will be frustrated at its slow pacing and clumsy references. The story opens in 1922 with Dr John Watson, in a new-fangled BBC recording studio, about to go on air for the first time to regale the tiny audience of radio listeners with his tales about cases worked with the famous detective, Sherlock Holmes. The action then shifts to the south coast where a body is found on a beach, and Holmes, who found her, is beside it being treated with contempt by a young whippersnapper of a junior police detective. We can all empathise with Sherlock, this doyen of crime solving. He’s now in his 70s and his days of violin-playing and fly fishing are over thanks to chronic arthritis. Since his “death” alongside his arch nemesis, Moriarty, at the infamous Reichenbach Falls, the great detective has been quietly retired to England’s south coast where he keeps bees and does his utmost to stay mentally alert. But it seems that crime, Moriarty, and his past life, won’t leave him in peace and a new game’s afoot. Someone is out to get him and he’s being drawn back into his old life, not entirely kicking and screaming. Powell makes an engaging Holmes although he doesn’t make much effort. There are times when you yearn for less inscrutability and a little more animation from the veteran actor. Liza Goddard, burdened with a dour ensemble of suffragette suits throughout, is Watson’s now estranged wife, Mary, who visits the sleuth to ask for help in cracking one last, very personal case. Reade has obviously done his homework and there is a nod to Conan Doyle’s interest in spiritualism. The relationship between Holmes and Watson is well observed. Placing these two old dinosaurs in unrecognisable, rapidly changing times, where electricity and invention has altered our lifestyles, is as pertinent then as now where the elderly still struggle with new technology. Roy Sampson offers terrific support as Sherlock’s brother, Mycroft. Cynical, arguably intellectually superior to his younger brother, Mycroft’s scenes with the seasoned investigator are the most credible. 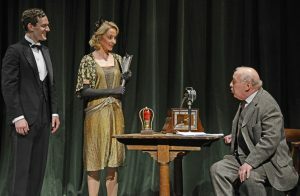 Timothy Kightley plays Watson along the usual lines although he barely shares a scene with his wife, Mary. He’s not fleshed out but when is he ever? The production is lacking in the quality you’d expect from Theatre Royal Bath. Jonathan Fensom’s set comprises, at times, of a familiar part of Holmes’ Baker Street flat but elsewhere is an almost bare, darkly lit, stage with just a few props. Time for the great man to take permanent retirement I think. He’s getting too old for this crime-fighting game. 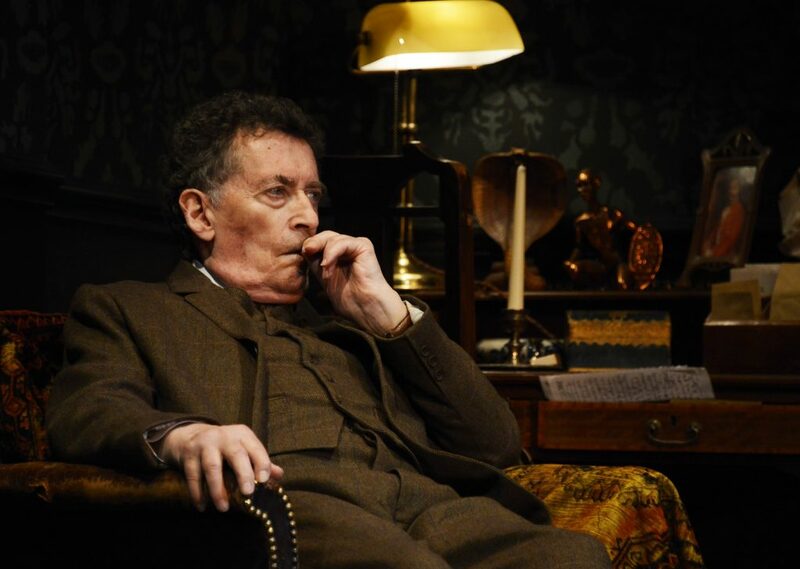 Review – Sherlock Holmes: The Final Curtain is thinly plotted and shows that, despite having two accomplished, leading actors in Robert Powell and Liza Goddard, it is time to permanently retire the nation’s favourite, once great, consulting detective.